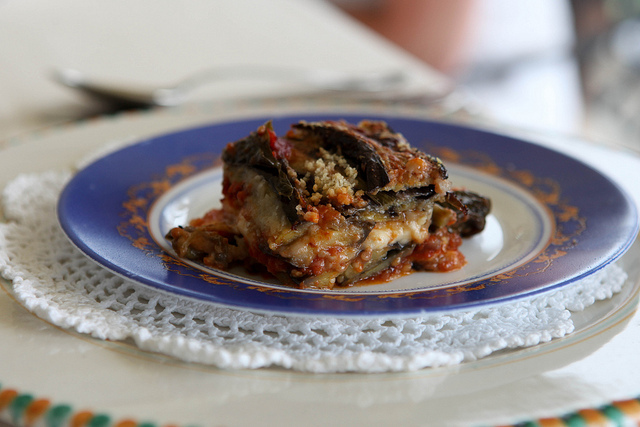 Parmigiana is a typical Italian dish made with fried sliced eggplants, layered with cheese and tomato sauce, then baked. The origin of the dish is claimed by even three Italian regions: Emilia Romagna, Campania and Sicily. Contrary to what is widely believed, the name Parmigiana does not mean “eggplants in Parma style” or “eggplants with Parmesan cheese”, but instead it derives from a Sicilian word “Parmiciana”, which means the set of wooden strips, that forms persiennes (shutters), like the way that eggplant slices are put in parmigiana. Step 1. Slice the eggplants horizontally about 1 cm thick, place the slices in a large colander, sprinkle with salt and set aside to rest for about 1 hour. Drain and rinse the eggplant, put them on paper towels and leave aside until they become dry. Step 2. Meanwhile prepare the tomato sauce: heat 2 spoons of extra-virgin olive oil with a clove of garlic, then add tomato purée and cook for 30 minutes on slow fire. At the end add some salt and basil leaves. Step 3. Fry dried eggplants in olive oil 3-4 minutes on both sides. Step 4. Place 1 small spoon of oil and 2 spoons of tomato sauce in a large pan. Than place a few slices of eggplant in a way to cover the entire surface of the pan. Place a thin layer of tomato sauce, than a layer of slices of mozzarella cheese. Sprinkle with Parmesan cheese. Repeat the layering process until all the ingredients have been used, finishing with eggplants – tomato sauce – Parmesan cheese. Step 5. Place the pan in the oven (preheated at 200°) for 40 minutes, until the top of the dish becomes golden brown.